You've probably seen the symbol—a solid blue horizontal line or bar bordered on the top and bottom by black rectangles: the thin blue line. These emblems can be spotted on the front license plates of cars and trucks, and they appear as stickers on rear windows, on T-shirts, websites, profile pictures, and even tattoos. But what does the thin blue line emblem mean? For some civilians, it connotes a show of support for the police, acknowledging the role these individuals dedicate themselves to in society. It represents the solidarity and brotherhood that police officers share as fellow professionals for others. This simple-looking emblem has multiple meanings, all arising from the same concept: police officers stand as a thin line that protects society from evil and chaos. But depending on who you talk to and which police department you ask, some additional meanings apply to the thin blue line. The Hamden Police Department in Connecticut believes that it represents the line between life and death that officers face every day. In some cases, it can be a tribute to an officer killed in the line of duty. The blue is derived from the traditional color of police uniforms. Most municipal police still wear blue, and the color has long been associated with law enforcement throughout the history of modern policing. The black simply serves as a stark contrast for the blue. The color itself is neutral, and it emphasizes the blue line. The term "thin blue line" is said to be derived from the "thin red line," and this dates all the way back to 1854. The thin red line was a battle formation assumed by the 93rd Highland Regiment of the British Army against the Russian cavalry at the Battle of Balaclava. Fast forward 57 years and the thin red line came to America...at least in poetry. Nels Dickmann Anderson wrote "The Thin Blue Line" in 1911, tweaking the color to blue, but he didn't associate it with police officers. It referred to U.S. Army in the poem. They wore blue uniforms at that time. The modern concept of the thin blue line and its association with police officers is said to trace back to 1966. It was introduced in a documentary that explored the cultural brotherhood of policing. It's come under attack innumerable times since then, first during the time of tumultuous civil unrest in the 1960s. This was a time when police were called "pigs," and "police brutality" was an accepted circumstance. This feeling carried forward into the 1970s. A documentary film titled "The Thin Blue Line," directed by Errol Morris, was then released in 1988 to critical acclaim. It was about the murder of a Dallas police officer and the term "thin blue line" was used by the prosecuting attorney at the trial in the depicted closing argument. Officers have recently been charged with taking the concept of the thin blue line brotherhood too far, extending "professional courtesies" to other law enforcement brothers, particularly for minor offenses. The charge is that the emblem on the bumper of a personal vehicle effectively says, "I'm one of you. Look the other way." Such theories have led some to criticize—and to misunderstand—what the solidarity of the thin blue line really means. Police officers and departments have suffered harsh criticism in the millennium as well, and the concept of the thin blue line has been repeatedly drawn into political and social frays. 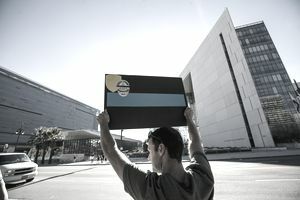 Counterprotesters carried thin blue line flags in November 2016 in Chicago when others gathered to protest the police shooting of Joshua Beal. Then, not even a year later, the thin blue line flag was seized upon by white nationalist groups at the Unite the Right rally in Charlottesville, Virginia in August 2017. In both cases, the flags were intended to support the police, but they were also taken—many say inappropriately—to be a show of resistance to the Black Lives Matter movement in Charlottesville. Police, like any other profession, have an understanding among each other for what they do and what they go through on a daily basis. If anything, the thin blue line demonstrates support for each another in a tough job. It's not an excuse to violate the high ethical standards that officers are held to, but rather an encouragement to stand on that line together in service of others.